It’s the first of September and with it comes the scent of autumn in the air. I was out foraging near Haddington at the weekend and although the sun warmed my back I could see the leaves tinged with splashes of autumn colours. Everywhere the warm oranges, reds and golden colours of autumn have begun to appear and with the turn of season I am reminded of how quickly time passes. Two years ago today I fell ill and would never have guessed how profoundly my life would change. In some ways that day seems like a lifetime ago but in other ways I can't believe how quickly time has gone. A year has gone by since my last blog post, however I have not been entirely idle. I’m not fully better yet but my health is progressing and since I last wrote I have completed a college course in floristry while working in a local flower shop earning my stripes and trained with the lovely Tallulah Rose Flower School. I wrote previously about my dream to run my own floristry business and this month I have made the decision to go for it and become my own boss! 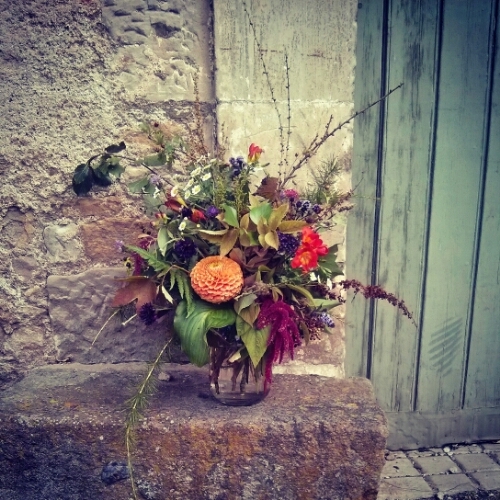 And so Briar Rose Design is born… I will offer bespoke floristry designs tailored to your needs whether it be a wedding, dinner, celebration or commiseration. It’s a scary, exciting, whirlwind adventure I’m starting out on and I’m sure there will be many times I question my sanity but I can’t wait to get started.